There are many choices when it comes to an Omaha custom deck builder. And when making an investment in your home, you want to ensure you’re getting the best value, the best products on the market and the best craftsmanship. At Decks, Decks and More Decks we bring to the table quality service, cutting-edge technologies and over 35 years of experience. On top of all this, we are Omaha’s only TrexPro®Elite Member. Trex manufactures low-maintenance materials for custom decks; providing a durable, safe and environmentally responsible product. As a TrexPro we adhere to Trex installation requirements and have proven to have our customer’s best interest in mind. Our Omaha deck building company also ensures our deck builders are well-educated in Trex products and participate in onsite training and demonstrations. 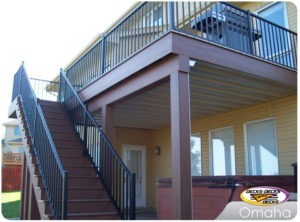 Our Omaha deck builders are dedicated to providing safe custom decks for better outdoor-living experiences. Trex is one of the many product lines we carry, and we are dedicated to the highest quality of service and craftsmanship, no matter what service or product you need from Decks, Decks and More Decks. This entry was posted in Custom Decks Omaha and tagged custom decks omaha, deck building omaha, decks omaha, Trex Decking on April 28, 2016 by Decks, Decks and More Decks. Summer is around the corner, and with the anticipation of warmer weather coming to Omaha also comes the anticipation of getting your outdoor entertainment space ready for family and friends. Adding a deck to your Omaha home is a perfect way to add usable and fun space to enjoy. And while it may seem like a feasible project for you to tackle on your own, consider the effortless planning hiring an Omaha custom deck builder would bring. Not only does our custom deck company have longevity and an extensive portfolio, we also have knowledge of building codes and zoning laws. This can be difficult for an Omaha home-owner to navigate. Additionally, your time is valuable. Decks, Decks and More Decks can build a custom, low-maintenance deck in a couple days, instead of the weeks or months it would take a DIY homeowner. Consider seeking professional guidance from an experienced Omaha deck building company as spring approaches. Our team of deck builders provide plans, permits, advice on low-maintenance material and a beautiful end-product for you to enjoy. Contact us at Decks, Decks and More Decks for a free consultation. This entry was posted in Custom Decks Omaha and tagged custom decks omaha, deck building omaha, decks omaha on April 14, 2016 by Decks, Decks and More Decks.